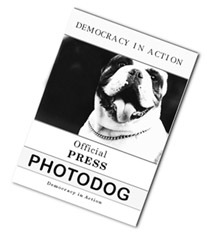 Copyright © 2005, 2006 Eric M. Appleman/Democracy in Action. Dec. 10, 2005-DNC Commission on Presidential Nomination Timing and Scheduling final meeting. Dec. 5, 2005-The Capitol Christmas Tree: lighting (Dec. 8), decorating (Dec. 5), arrives (Nov. 28). Nov. 14, 2005-Sen. John McCain (R-AZ) signs copies of Character Is Destiny at the Trover Shop. Nov. 13, 2005-Gov. Mark Warner (D-VA) after an appearance on CBS News' "Face the Nation." Nov. 10, 2005-Sen. John McCain (R-AZ) speaks on "Winning the War in Iraq" at the American Enterprise Institute. Nov. 10, 2005-Democratic leaders say they are "organized and united to pursue America's priorities." Nov. 9, 2005-Gov. Mike Huckabee (R-AR) receives a Public Official of the Year award from Governing magazine. Nov. 9, 2005-DNC Chair Howard Dean and DGA Chair Gov. Bill Richardson (D-NM) hail results of the Nov. 8 elections. Nov. 7, 2005-Gov. Mark Warner (D-VA) at a campaign rally for Tim Kaine and Democratic candidates in Alexandria, VA.
Nov. 6, 2005-Former Speaker Newt Gingrich after an appearance on ABC News' "This Week." Nov. 1, 2005-DNC Chair Howard Dean and RNC Chair Ken Mehlman at NAACP event. Oct. 25, 2005-Gov. Tom Vilsack (D-IA) hosts a DLC forum on "Progressive Solutions to National Budget Crisis." Oct. 16, 2005-Sen. Chuck Hagel (R-NE) answers questions after an appearance on CBS News' "Face the Nation." Oct. 1, 2005-DNC Commission on Presidential Nomination Timing and Scheduling holds fourth meeting. Sept. 29, 2005-Sen. Hillary Rodham Clinton (D-NY) speaks at a DNC Women's Leadership Forum event. Sept. 28, 2005-Former New York Mayor Rudy Giuliani speaks at the Friend of Israel Award Banquet. Sept. 23, 2005-Gov. Mike Huckabee (R-AR) unveils Healthy America initiative. Sept. 19, 2005-Carter-Baker Commission on Federal Election Reform issues its report. Sept. 8, 2005-Sen. Hillary Rodham Clinton (D-NY) speaks at the Alliance for Retired Americans' 2005 Legislative Conference. Sept. 6, 2005-Gen. Wesley Clark (ret. ), Sen. Chuck Hagel (R-NE) address "Terrorism, Security & America's Purpose" Conference. Aug. 19, 2005-Former Speaker Newt Gingrich speaks on "A Vision for a 21st Century Medicaid Solution." July 22, 2005-Sen. Hillary Rodham Clinton (D-NY) addresses the College Democrats of America 2005 National Convention. July 14, 2005-MoveOn.org demonstration calling on President Bush to fire senior advisor Karl Rove. June 21, 2005-DNC "Paint the Nation Blue" fundraiser. June 21, 2005-Sen. Joe Biden (D-DE) delivers a speech on "U.S. Policy in Iraq: Rhetoric vs. Reality" at the Brookings Institution. June 21, 2005-Floridian Bob Kunst of hillarynow.com promotes a Clinton/Biden ticket in front of the Brookings Institution. June 19, 2005-Sen. Joe Biden (D-DE) takes questions after an appearance on CBS' "Face the Nation." June 16, 2005-Gov. Mike Huckabee (R-AK) addresses the American Symphony Orchestra League's National Conference. June 15, 2005-Presidents of five large unions announce Change to Win Coalition. June 11, 2005-DNC Executive Committee meets. June 2, 2005-Former Sen. John Edwards addresses the Campaign for America's Future's "Take Back America" conference. May 22, 2005-Sen. George Allen (R-VA) speaks to reporters after an appearance on ABC's "This Week." May 9, 2005-Battle over judicial nominations heats up. Cake deployed. May 4, 2005-Sen. George Allen (R-VA) at the Latino Coalition's 2005 Latino Small Business Economic Conference. May 2, 2005-Gov. Mark Warner (D-VA) addresses the 2005 annual meeting of the American Hospital Association. April 26, 2005-"Rally to Stop Privatization and Protect Social Security." March 14, 2005-DNC Chairman Howard Dean addresses Democratic Municipal Officials at the National League of Cities Congressional City Conference. March 6, 2005-Sen. Chuck Hagel (R-NE) answers questions after an appearance on CBS' "Face the Nation." Feb. 28, 2005-Gov. Bill Richardson (D-NM) at a Democratic Governors' Association press conference. Feb. 25, 2005-Former Speaker Newt Gingrich discusses his book "Winning the Future" at the American Enterprise Institute. Feb. 18, 2005-Crystal Dueker of Fargo, ND advocates for Condoleezza Rice in 2008 at the 2005 Conservative Political Action Conference. Feb. 11, 2005-Gov. Howard Dean addresses the GLBT caucus one day before becoming the new chairman of the Democratic National Committee. Jan. 31, 2005-House Democratic Leader Nancy Pelosi and Senate Democratic Leader Harry Reid deliver pre-buttal to State of the Union.